The PD-1 immune checkpoint is essential for self-recognition by the immune system, with disruption of the pathway associated with several autoimmune disorders. However, the involvement of PD-1 and its ligand PD-L1 in muscle-weakening autoimmune disease myasthenia gravis is unclear. 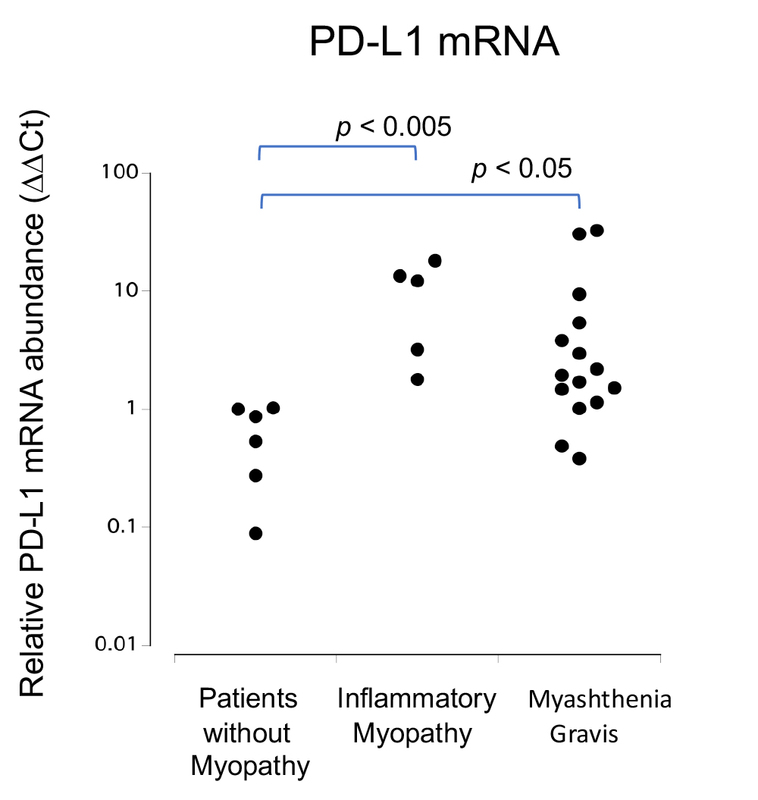 Now, researchers at Kanazawa University have linked increased PD-L1 expression in the muscles of myasthenia gravis patients with disease severity and shown that this could ultimately help control the immune response and modulate disease symptoms. Kanazawa, Japan – Quite literally meaning “grave muscle weakness”, myasthenia gravis is a chronic autoimmune disorder that causes serious weakening of skeletal muscles responsible for movements such as ocular motion, eye-opening, swallowing, and breathing. Although symptoms can be controlled, there is currently no cure for this potentially debilitating disease. In normal muscle tissues, movement is triggered when nerve endings release a neurotransmitter called acetylcholine, which binds to a receptor on muscle cells. This binding activates the muscle and causes it to contract. Myasthenia gravis occurs when the immune system—which usually protects us from invading pathogens—mistakenly attacks the acetylcholine receptors needed for muscle movement. Controlling the immune response is therefore key to treating myasthenia gravis. 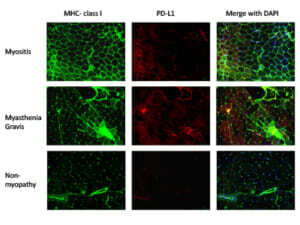 Using a specific fluorescent antibody, or marker, that binds to PD-L1, the research team showed that the ligand was more abundant in muscle tissues collected from myasthenia gravis patients compared with muscles from healthy individuals. Studying gene expression in these tissues confirmed their initial findings, with results showing that the PD-L1 gene was more highly expressed in patient tissues. Importantly, there was no difference between male and female patients, and gene expression was not influenced by the presence of tumors in the thymus, the organ responsible for the maturation of T-cells. However, there did appear to be a reciprocal association between PD-L1 gene expression and disease severity. 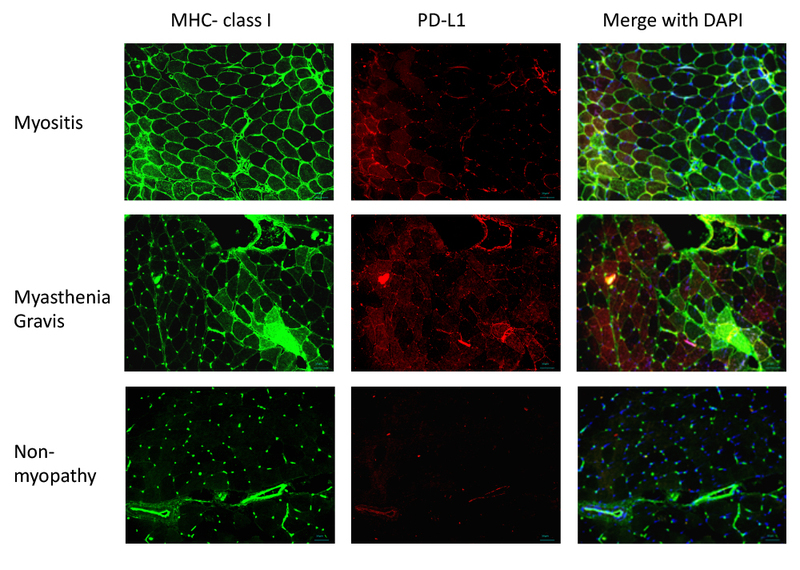 MHC class I and PD-L1 expression in the muscle tissue, as detected by immunohistochemistry. MHC class I and PD-L1 expression was upregulated in the sarcolemmal and sarcoplasmic regions in patients with myositis and myasthenia gravis. There was no overexpression of MHC class I and PD-L1 in muscle tissues obtained from patients with non-myopathy. qRT-PCR analysis of PD-L1 mRNA levels in muscle cells. Relative PD-L1 mRNA expression levels were significantly increased in patients with myasthenia gravis (MG) and myositis when compared to those in patients with non-myopathy (NM) (MG vs. NM p < 0.05, myositis vs. NM p < 0.005). General additive model of quantitative myasthenia gravis scores for disease severity (QMG score) and PD-L1 mRNA expression in the skeletal muscle. 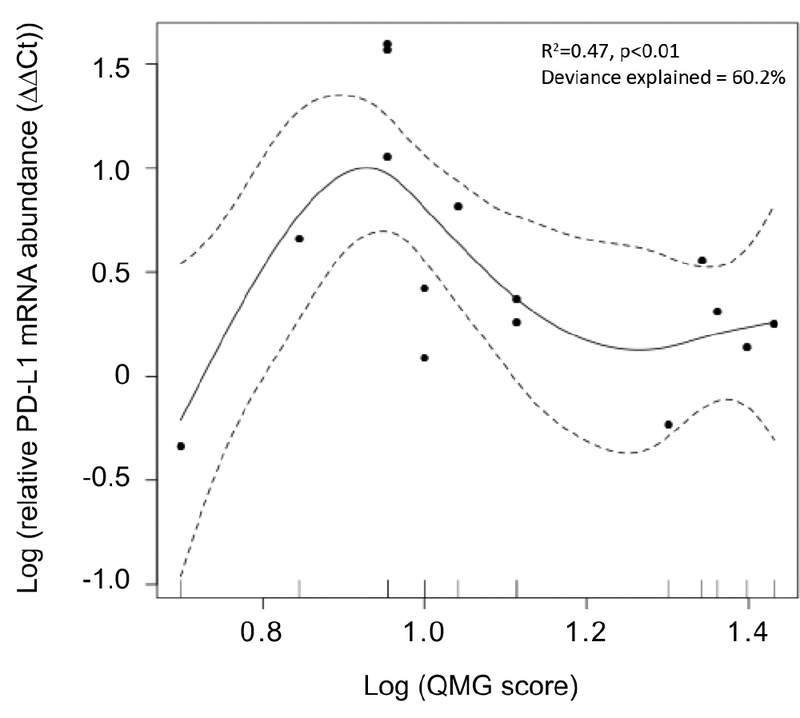 Relative PD-L1 mRNA levels showed a unimodally distributed correlation with QMG score. This study was funded by the Japanese Ministry of Education, Science, Sports, and Culture (grant no. 18K07494 to KI).